Is it bad that my MacBook Air is passing me electricity? Whenever my MacBook Air is connected to the AC power and I have my hands on the palm rest, I feel it passes some electricity to me. If I unplug it from the AC power it stops doing that. This has recently became obvious, when other people can feel this tingling by touching my skin after I've been working for a while. 1- Is this normal in unibody Macs? 2- Is this harmful for my health in the long run? Electrical current passed from e.g. a MacBook Air can be avoided by plugging your Mac into a grounded power outlet. I sometimes get this too when using a non-grounded power outlet. I am assuming you are referring to being able to sense "vibrations" as you e.g. slowly and lightly move your fingers upwards on the palm rest? I have found that when I have my Macbook Pro plugged into a non-grounded outlet and I touch something that grounds me - e.g. a radiator, I can feel the vibrations. If I stop touching the radiator, the vibrations cease! Try rotating the power adapter (plug it the other way, if this is possible with your power outlets - in some countries it's not). Use a grounded cable and socket - The default US/EU adaptors plug does not have a ground, however if you use the extension cable with the charger, you will use the ground pin of the charger (ground pin is the metal ring, you can see when you remove the adapter, just above the serial number). A very easy (and ugly) solution would be to ground the macbook itself - just tape a naked strand wire to the alu shell and the other end to a ground (by ground I mean ground). If you think your mac is giving you an electric shock while plugged into the mains then you need to unplug it from the mains and not plug it in again until you've been to an Apple store (or other reputable computer repair place) and had it tested. This is absolutely not normal and potentially very unsafe. In fact consider that a default position for any consumer electronics you interact with. Electric shocks are not normal! I had this with my MBP when I received it. It stopped when I changed the plug to use the one with the ground connection (don't know how it's called exactly). 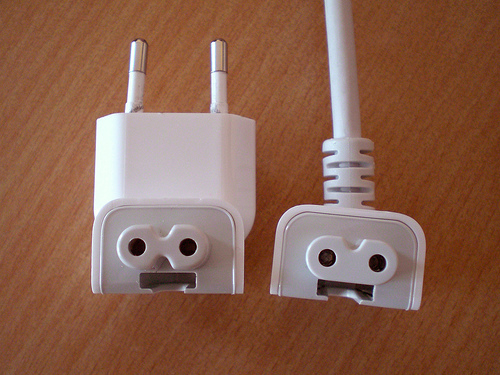 They provovide usually two plugs. A short one, with only two pins and longer one with three pins and connection to the ground. You should use this one. had same issue. Bought mba 11 (mid 2011) model and felt this electrostatic flow while charging my mac. Changed it to long cable adapter with ground and problem solved. People that don't experience this kind of issue might have been in a place that already have their power outlet grounded. Also check your power extension if its faulty or try to charge on different power outlet. I had this happen a lot with the TiBooks of about a decade ago but haven't had it with any unibody machines, so I wouldn't say it was normal now, perhaps there's a minor fault with your machine, I can't tell you if it's bad for you or not but I'd recommend you take it back to a store and show them at least. Not the answer you're looking for? Browse other questions tagged macbook . Why would a new MacBook Pro charger fail in one month? My Macbook Pro gives electric shocks. How can i measure it? Current passing through me from Macbook to iMac? New MacBook Pro Retina, bad battery?